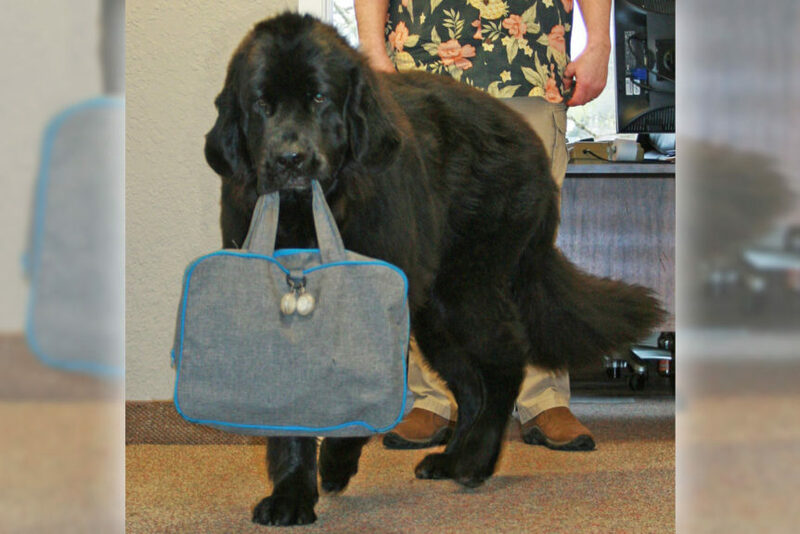 Have you seen a 122-pound briefcase-toting beast in a dark, furry coat wandering the Wicks Emmett offices? It’s not a new CPA. That’s Max—short for Maximus—and he’s the giant-sized pride and joy of WE partner and CPA Jim Treanor-Weaver. The 4-year-old purebred Newfoundland comes to work every week with Jim, bringing a joyful tail-wag to everyone he meets. Jim and his wife, Krisy, adopted Max through a friend. The then 10-month-old dog needed a new family, one that could spend time with him and give him the attention he craved. The Weavers were looking for a new dog, and “he just fell into our laps,” recalls Jim. It took some time, however, for Max to settle into his new home. He came to Jim and Krisy as a hungry, frightened, aggressive puppy who was unsure around strange people. Max is now a completely different dog. He’s a happy, healthy, well-socialized adult, thanks to patience, love, veterinary visits, and several dog obedience courses—along with a weeklong boot camp with his dog trainer. Max goes to the office every Tuesday with Jim, and it’s a job he takes very seriously. True to his breed, this dog is a worker who loves to be around humans. “In the morning, he prances across the parking lot and into the office with his briefcase like he has a job to do,” Jim says. That dog-sized gray and blue briefcase contains all his gear—including a short walking leash, a longer leash for the park, special dehydrated meat treats, a drool towel and his magic stick, “his favorite toy on the planet,” Jim laughs. Max doesn’t crunch numbers like Jim, but he has drawn quite a following from clients and WE staff. When he’s not at the WE office, Max spends time with his other people—including Krisy, Jim’s mom and the staff at his doggy daycare center. Max also tends to his feathered and furry siblings. Like every dog, Max has his personality quirks. He loves to play with tiny dogs. He can be a bit aloof and standoffish. He wants to destroy all lizards and will demolish a brick pile to get one. He will also let you know if he really likes you. When you see Max meandering about the WE offices, stop and give him a friendly pet. This office mascot loves the attention—and if you’re lucky, he might take you for a walk!